1. Get a pedicure …and 2. buy a new pair of shoes! There’s something about physically walking into a new year with fresh toes & fresh shoes that just makes sense to me. Is that strange? Can anyone else relate? Or am I solo on this one lol. 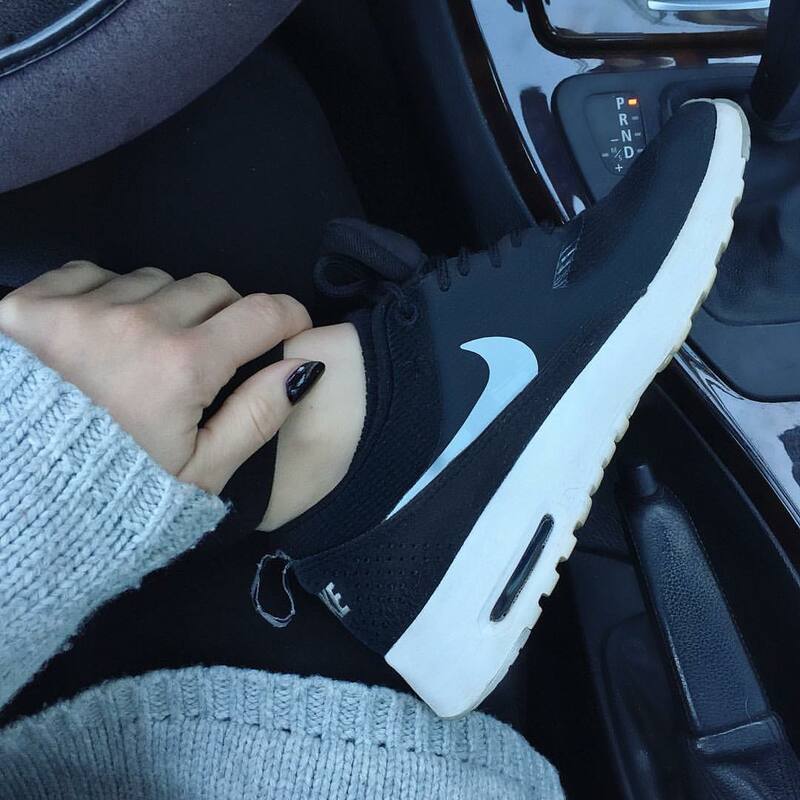 I got a pedicure right before NYE (Essie “Island Hopping”) & on New Years Day, I picked up a new pair of sneakers! Over the last year, I’ve been wearing & appreciating sneakers more than I ever have before. You know that I love my black Nike Thea’s… I wore them quite a bit in 2016! … but I wanted to start adding some variety to my sneaker collection! I’m initially drawn to black shoes, but I needed to switch it up. I didn’t want too crazy of a color, I wanted something that would match with most outfits; so I picked out this white/grey pair of Nike’s at Six:02! The sweatshirt is Mike’s Blackout SOUL hoodie! He just restocked, but I think they’re almost sold out. Eeek! Shop them here before they’re gone!! These shoes are the Nike Air Huarache Ultra’s and they are so darn comfortable! I have major blisters-behind-my-ankle issues & these sneakers completely eliminate that problem! The stretchy fabric around the back of the shoe serves as a soft & flexible alternative to your traditional structured sneaker – GAME.FREAKING.CHANGER! Have you tried this shoe before?! Are they not insanely comfortable? Do you have a favorite pair of sneaks? Mine are kinda low ankle, I wish I could post a pic. I can do boots but my problem is in the summer all of the heels and straps tear up my ankles. It’s like I have no skin back there or something! 😮 Happy New Year to you too! Pedis and shoes are two of my very favorite things! You are not alone on this one. I have never been into sneakers much in the past, but I am so into them lately. Thanks for sharing; I need to add to my collection! Love the sneaks you chose! I agree, I love getting a new pair of shoes at the beginning of each year. My birthday is in January though, so maybe I just always ask for them on my birthday haha. I hope you’ve had a great start to the new year! I’m sure great things are ahead for you this year! You look freezing & cozy all at the same time =) BTW those sneakers are on sale!!! Score!!! haha under pressure photograph, love it! I am definitely going to have to check these out! Im so iffy with sneakers though my feet look so weird in them. Those are so cute! I think you should go with I and C next. 😉 I have a pair of Reeboks that are super comfy.They are dark gray and hot pink, they actually kind of look similar to yours with the netting over the top. We love them so much that hubby got a pair in mens in blue and black. Come to think of it, we must just be a Reebok family because both kids have Reeboks too lol. Glad you are entering into the new year with fancy fee. 😉 Enjoy! Oh my gosh, I am OBSESSED with those sneakers! Too CUTE! You know, now that you mention it, I think that’s a genius idea! “Prep” your feet for your journey of the new year! I love it! Haha! I always feel so grody walking into the New Year with gross toes. I don’t always grab new shoes, but a fresh pedicure is a must! And OMG I LOVE your sneaker washing idea!! I’ve never heard of that and will be 100% trying it when I need to wash them. THANK YOU!! I’m the worst sure keeping my sneakers clean so I look forward to reading so the tips!